Was signed by the Astros as a 21-year-old nondrafted free agent out of the Dominican Republic on March 18, 2015...signed by Astros scouts Oz Ocampo, Tom Shafer, Roman Ocumarez and David Brito...Added to the Astros Major League roster in September of 2018...signed to a one-year contract that runs through the 2019 season. Made his Major League debut in August and dazzled over the final two months of the season...generated groundballs at an extremely high rate, posting a 70.3% groundball rate and a 4.27 groundball to flyball ratio... among MLB rookies with at least 30.0 innings pitched, ranked first in groundball rate, second in ERA and sixth in opponent batting average (.175)...was successful as both a starter and a reliever...went 2-1 with a 2.59 ERA (7ER/24.1IP) and 20 strikeouts in his five starts, and 2-0 with a 1.42 ERA (2ER/12.2IP) in three relief appearances... left-handed hitters went just 4x32 (.125) with no extra-base hits against him...began the season at Double A Corpus Christi...was promoted to Triple A Fresno on Aug. 8...was selected to the Major League roster on Aug. 21...made his MLB debut on Aug. 21 at SEA, tossing 4.1 innings of relief...allowed one unearned run on two hits, striking out four while leading the Astros to a 3-2 win...earned his first Major League victory...entered the game in the 2nd inning with two on and two outs and got the Astros out of the jam unscathed...became the fifth pitcher in club history to throw 4.1+ relief innings in a MLB debut, and just the second to do so while recording a win, joining Don Wilson, who threw 6.0 innings and got the win in his debut on Sept. 29, 1966 at CIN...became the second pitcher in Astros history to throw 4.1+ relief innings without allowing an earned run in a Major League debut, joining Joe Musgrove, who went 4.1 scoreless innings his debut on Aug. 2, 2016 vs. TOR...made his first Major League start on Aug. 26 at LAA and tossed 5.0 innings, allowing one run on two hits with three walks and three strikeouts in the Astros 3-1 win...got his second Major League victory and first as a starter...became the fifth pitcher in franchise history to earn a win in his first two Major League appearances... also Bill Dawley (1983), Mark Lemongello (1976), J.R. Richard (1971) and Don Wilson (1966-67)...became the first pitcher in Astros history to go 4.0+ innings pitched while allowing one run or fewer in each of his first four career appearances in the Major Leagues...also became the sixth pitcher in MLB history to start a career like this...also Fernando Valenzuela (7g in 1981), Cliff Markle (5g from 1915-16), Kenta Maeda (4g in 2016), Cody Anderson (4g in 2015) and Drew Smyly (4g in 2012)...also became the second pitcher in franchise history to allow two hits or fewer in each of his first two starts in the Majors, joining Taylor Buchholz (2006)...on Sept. 23 vs. LAA, provided the Astros with 6.0 innings of one-run ball, striking out nine in relief of Charlie Morton, who left the game after the 1st with discomfort in his right shoulder...the 6.0 innings and nine strikeouts both marked new career-highs...became the first Astros pitcher to toss at least 6.0 innings in a relief outing since Dave Borkowski on Aug. 15, 2006 vs. CHC...became the first Astros pitcher to strike out nine batters in a relief appearance since Jerry Reuss fanned 10 batters in 7.1 relief innings on Sept. 22, 1972 vs. CIN...24-year-old also became the youngest left-handed pitcher to strike out nine batters in a relief appearance since a 23-yearold Johan Santana struck out nine batters in 4.1 innings of relief innings on Sept. 2, 2002...in 22 combined games (14 starts) between Double A Corpus Christi (20g) and Triple A Fresno (2g), went 6-5 with a 4.11 ERA (47ER/103IP) and 129 strikeouts...prior to his promotion to Triple A, was leading the Double A Corpus Christi Hooks in strikeouts with 120, which also ranked second in the Texas League...was a Double A Texas League Midseason All-Star...named the Astros Minor League Pitcher of the Month for July after posting a 0.40 ERA (1ER/22.1IP) in four appearances, including three starts...had his best minor league start of the season on July 30 vs. San Antonio, tossing 7.2 scoreless innings, allowing just two hits, while punching out 12. Went a combined 7-8 with a 4.16 ERA (51ER/110.1IP) and 126 strikeouts in 25 games (18 starts) between Double A Corpus Christi (12g) and Class A Advanced Buies Creek (13g)...impressed in five Spring Training games with the Astros as a minor league call-up, striking out seven batters in 7.0 innings...began the season at Buies Creek, where he went 2-3 with a 2.79 ERA (19ER/61.1IP), 29 walks, 73 strikeouts and a .185 opponent batting average in 13 games (9 starts)...his final start at the level was a gem on June 28 vs. Carolina...struck out 11 batters over 8.0 innings of one-run ball, surrendering just three hits...was then moved up to Double A Corpus Christi where he posted a 5-5 record and a 5.88 ERA (32ER/49IP) with 53 strikeouts in 12 games (9 starts)...pitched in the Arizona Fall League in 2017, going 1-1 with a 3.20 ERA (7ER/19.2IP) and 14 strikeouts in six starts for the Mesa Solar Sox. Pitched at four levels in the Astros system, combining to go 4-5 with a 3.19 ERA (26ER/73.1IP) and 79 strikeouts...began the year at Rookie Level Greeneville...allowed two runs in two starts and 10.2 innings (1.69 ERA), striking out 15...was named the Appalachian League Pitcher of the Week for the week of June 27-July 3...threw 6.0 shutout innings on July 2 vs. Kingsport, striking out eight and allowing one hit...moved up to TriCity and went 2-1 with a 3.74 ERA (9ER/21.2IP) and 28 strikeouts in five games (2 starts)...was promoted to Class A Quad Cities and also found success, posting a 3.06 ERA (12ER/35.1IP) and 35 strikeouts with one complete game in six starts...ended the year at Class A Advanced Lancaster, making one start (3ER/5.2IP). Began his professional career with the Dominican Summer League Astros, going 4-1 with a 3.68 ERA (15ER/36.2IP) and 36 strikeouts in 16 games. April 21, 2019 Houston Astros recalled LHP Framber Valdez from Round Rock Express. 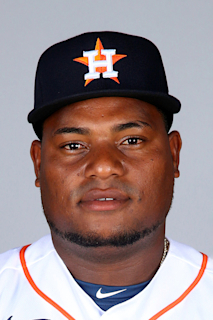 April 11, 2019 Houston Astros optioned LHP Framber Valdez to Round Rock Express. December 4, 2018 Aguilas Cibaenas placed LHP Framber Valdez on the reserve list. November 5, 2018 LHP Framber Valdez assigned to Aguilas Cibaenas. August 21, 2018 Houston Astros selected the contract of LHP Framber Valdez from Fresno Grizzlies. August 8, 2018 LHP Framber Valdez assigned to Fresno Grizzlies from Corpus Christi Hooks. July 23, 2018 Corpus Christi Hooks activated LHP Framber Valdez. July 16, 2018 LHP Framber Valdez roster status changed by Corpus Christi Hooks. January 25, 2018 Houston Astros invited non-roster LHP Framber Valdez to spring training. July 18, 2017 Corpus Christi Hooks activated LHP Framber Valdez from the temporarily inactive list. July 16, 2017 Corpus Christi Hooks placed LHP Framber Valdez on the temporarily inactive list. July 9, 2017 Corpus Christi Hooks activated LHP Framber Valdez from the temporarily inactive list. July 6, 2017 Corpus Christi Hooks placed LHP Framber Valdez on the temporarily inactive list. July 2, 2017 LHP Framber Valdez assigned to Corpus Christi Hooks from Buies Creek Astros. June 15, 2017 LHP Framber Valdez assigned to Buies Creek Astros from Tri-City ValleyCats. June 10, 2017 LHP Framber Valdez assigned to Tri-City ValleyCats from Corpus Christi Hooks. June 8, 2017 LHP Framber Valdez assigned to Corpus Christi Hooks from Buies Creek Astros. February 27, 2017 LHP Framber Valdez assigned to Houston Astros. September 7, 2016 LHP Framber Valdez assigned to Quad Cities River Bandits from Lancaster JetHawks. September 2, 2016 LHP Framber Valdez assigned to Lancaster JetHawks from Quad Cities River Bandits. July 27, 2016 LHP Framber Valdez assigned to Quad Cities River Bandits from Tri-City ValleyCats. July 6, 2016 LHP Framber Valdez assigned to Tri-City ValleyCats from Greeneville Astros. June 22, 2016 LHP Framber Valdez assigned to Greeneville Astros from Tri-City ValleyCats. June 17, 2016 LHP Framber Valdez assigned to Tri-City ValleyCats. June 3, 2016 LHP Framber Valdez assigned to DSL Astros Orange from DSL Astros Blue. May 30, 2015 LHP Framber Valdez assigned to DSL Astros Blue. March 19, 2015 Houston Astros signed free agent LHP Framber Valdez to a minor league contract.